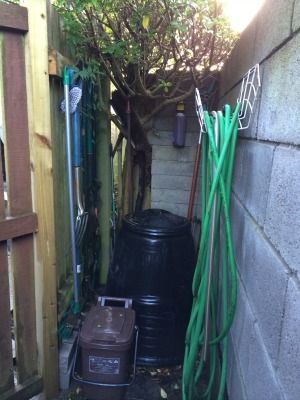 You are here: Home / Loving Nature / DIY Compost – so easy you definitely should bother! DIY Compost – so easy you definitely should bother! So easy, there really is no reason not to compost! Hmm. Not the most exciting subject but one that serves many purposes. Here in the UK, recycling is the order of the day in most towns. We are given bins for paper, card & bottles, a bag for plastics, cans & food packaging, a bin for food waste and then, an occasional bag for what rubbish is left to be sent to landfill. So, if we are good citizens, we’re already saving our food waste for the municipality to recycle, so why not throw this same rubbish on our own compost heaps? Every season, even in my tiny garden, I go off & buy a quantity of compost to refresh the soil in my garden and containers. I take a fair amount of garden waste to the municipal dump. I waste considerable time & energy parceling up the waste, driving to the dump, queuing for up to 20 minutes for my turn to dump the rubbish, and then drive home again! Why, when with less effort, I can recycle much of this same waste and reuse it in my garden next season to enrich my soil? Composting can be done all year & containers can usually be bought from your local council (that’s where I bought mine, for under £10), garden centre or hardware store. These should be set on level ground that is not subject to dramatic changes in temperature, can be on soil or on a concrete or solid base. There should be enough space for the air to circulate and for the worms to get in to do their work! Throughout the year you can add to your heap. 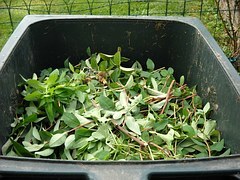 About one-third of the contents should be ‘green’ – grass clippings, annual weeds, vegetable peelings & greens, etc. with the remainder being made up of your ‘browns’ – woody prunings from hedges, trees & shrubs, egg boxes and crushed shells, scrunched up paper, cardboard, dead leaves, etc. Pet poops/manure should not be added to your bins! The best compost is produced when you have the right balance between the two, so that the bacteria & micro-organisms that produce the compost can function best. If you wish to add all your food waste to your compost heap, you will need to use either a Bokashi Bin or have a Worm Farm. Both of these are really useful, as they also produce a liquid ‘tea’ which you dilute with water to use as a liquid fertiliser. See here and here for more information on these although we will re-visit these another day. Another alternative to all of these, is to have a Green Cone or Johanna – visit www.greatgreensystems.com where you can also find the full story on worm farms and bokashi bins. Ideally, the heap should be turned regularly to introduce air & encourage break down of the contents. You can buy aerators to use in a bin, & accelerators to make the process faster are also available – I will be trying these soon & let you know if they help! 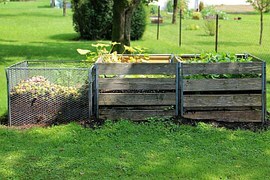 The compost should take between 6 & 24 months to mature and be ready for use. There is a lot of information out there on making compost & the best containers to use or make. Your decision will be based both on your available space & budget – I’ve found one system on sale for £275 compared to £5 for a simple bin from the council! Please share any composting tips, successes (or failures!) that you may have had!